A flood alarm system developed by East Century Technology of the Guiyang High-tech Industrial Development Zone (Guiyang HIDZ) won the top prize at the Water Conservancy Science and Technology Awards in Guizhou province, local media reported on Jan 11. The alarm system, known as East Auspicious Cloud, is believed to be the world's only system which acts as both a flood alarm and a water resource management system at the same time. It relies on a multi-data base, collecting a large amount of data through remote sensing, including landscape and climate data. By analyzing the data, floods can be accurately predicted. The system is designed for use in places such as flood control departments, water reservoirs and hydropower stations. 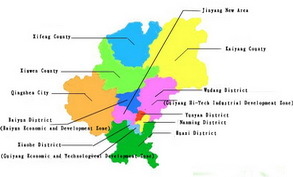 Officials of Guiyang HIDZ said the zone plans to further integrate big data with real economy, with hopes of making it an important driving force behind the zone's development within the next few years.